*The % Daily Value (DV) tells you how much a nutrient in a food serving contributes to a daily diet. 2,000 calories a day is used for general nutrition advice. 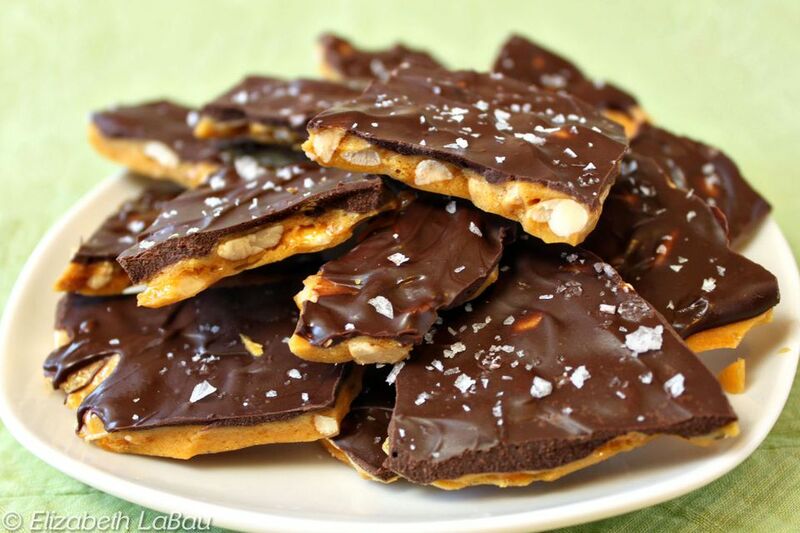 Salted chocolate peanut brittle is a delicious twist on old-fashioned peanut brittle. The familiar nutty treat is coated with a layer of chocolate and a hefty pinch of flaked sea salt. The sweet and salty combination is fantastic, and the rich chocolate contrasts nicely with the crunchy brittle. This recipe works best if you use a flaked or large-grained sea salt as a finishing touch on top of the chocolate, instead of a finer kosher or table salt. Prepare a baking sheet by lining it with aluminum foil and spraying the foil very well with nonstick cooking spray. In a heavy 4-quart saucepan, combine the sugar, water, and light corn syrup, and place the pan over medium heat. Stir until the sugar dissolves, then raise the heat to medium-high and insert a candy thermometer. Cook the candy over medium-high heat until it reaches 260 F (126 C). At this point, add the peanuts, the butter, and 3/4 tsp of salt, and stir well. Turn the heat back down to medium. Cook the candy, stirring frequently, until it reaches 295 F (146 C). During the cooking process, it will develop a dark golden color and begin to smell like caramelizing sugar. As soon as the candy reaches 295 F, remove the pan from the heat and add the vanilla and baking soda and stir them in. The baking soda will cause the candy to foam up quite a bit. Scrape the candy out onto the prepared pan and spread it into as thin a layer as possible. Let the brittle cool for a few minutes, until it is still pliable but not burning hot. If you have food-safe latex gloves, you might want to put them on to protect your hands from the heat. Otherwise, spray your hands with nonstick cooking spray. Carefully start pulling the brittle between your hands, stretching it as thin as possible. When you can no longer stretch it, let it cool completely at room temperature, for about 40 minutes. Once cool, melt the chocolate and pour it over the top of the brittle. Spread it into a thin layer so that the brittle is entirely covered. While the chocolate is still wet, sprinkle the top with the flaked sea salt, then let the chocolate set completely. Break the brittle into small pieces to serve. Store salted chocolate peanut brittle in an airtight container at room temperature for up to two weeks. If you live in a humid environment, you might find that your brittle becomes soft and sticky over time. Naturally Sweetened Peanut Brittle - Zero Refined Sugar! Irish Potatoes Candy for St. Patrick's Day—Just Like See's Candy!